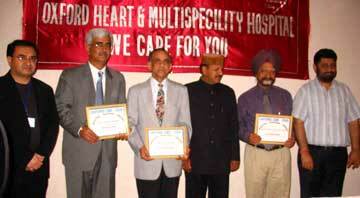 Dr. Rajiv Bindal, Himachal Pradesh Minister for Health and Family Welfare conferred the Doctors Master Teacher Awards to three prominent Doctors engaged inthe field of continuing Medical Education (CME) in a function organized by Oxford Heart and Multi-Specialty Hospital, Chandigarh last evening. The recipients of these awards include Former Director and Head of Medicine Department, PGI, Dr. B.K. Sharma, Nephrologist Dr. K.S. Chug and Gastro-Entrologist Dr. D.K.Bhasin. The function was attended by Mayor Pradeep Chhabra and Councillor Dr. A.P. Sanvria besides 200 Doctors drawn from CME Delhi, Jalandhar, Ludhiana and PGI Chandigarh.